Virtual New Zealand Stamps: 2015 - Queen Elizabeth II. 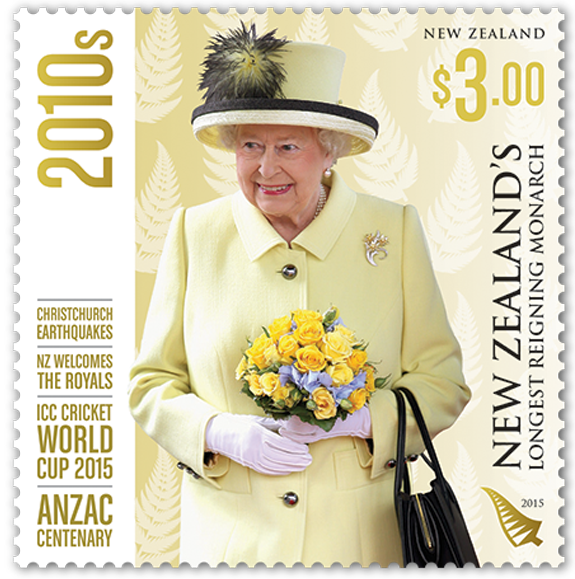 2015 - Queen Elizabeth II. New Zealand's Longest Reigning Monarch. 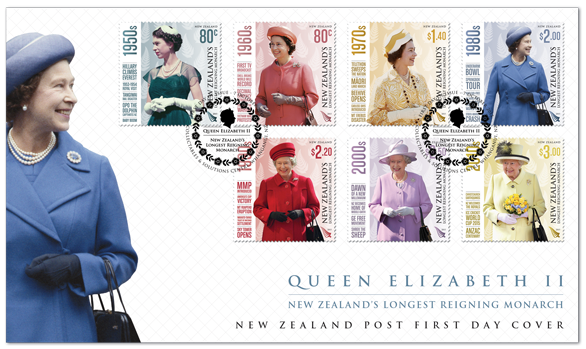 As New Zealand did not become part of the British Empire until three years after Victoria’s accession to the throne in 1837, Queen Elizabeth II has been New Zealand’s longest-reigning monarch for some time. 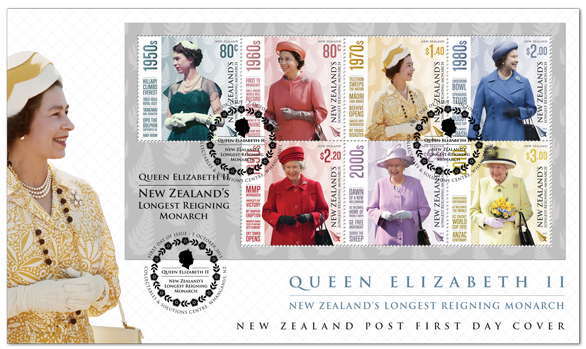 Queen Elizabeth II is the only ‘Queen of New Zealand’ we’ve ever known, as during Queen Victoria’s reign New Zealand was a British colony rather than a Realm. 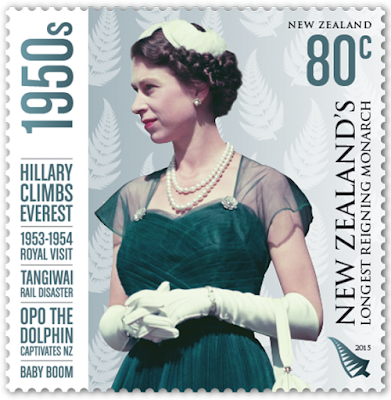 On 28 May 1953, Her Majesty formally became ‘The Queen of New Zealand’ - the first Sovereign to hold this title. During her reign Queen Elizabeth II has maintained close links to New Zealand, and has visited ten times since her inaugural tour in 1953/54. Although her last visit was in 2002, we still maintain a strong bond with the monarchy, with more recent visits made on her behalf by William and Catherine, the Duke and Duchess of Cambridge, who last visited in 2014 along with their son Prince George of Cambridge. On 9 September 2015, Queen Elizabeth II succeeded Queen Victoria as the longest reigning British monarch. 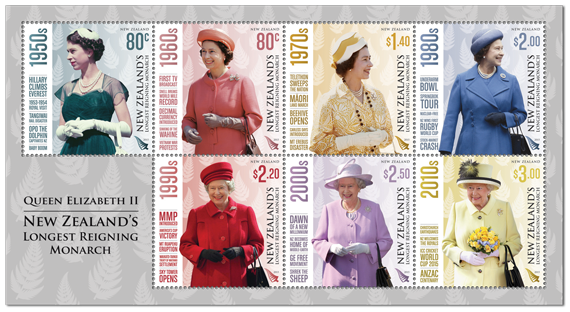 To celebrate this amazing milestone, New Zealand Post is issued a special set of seven stamps, each value representing a different decade of her reign. I really like these stamps. Each is a lovely photo of Queen Elizabeth II during each decade of her reign. What I like is the clothes she is wearing, showing the change of fashion and the changes of her clothing styles as she became older. Since each stamp tells a story I have chosen to display them using a larger format. 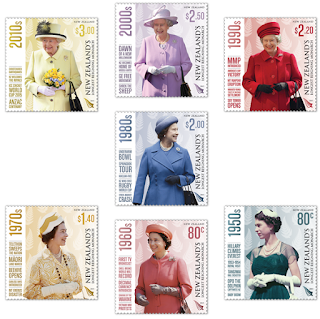 To show the vast span of time for which Queen Elizabeth II has reigned, each stamp in this issue represents a different decade. A photo of the Queen from each decade is shown next to a typographic depiction of various events that took place in New Zealand with the Queen as our Head of State. 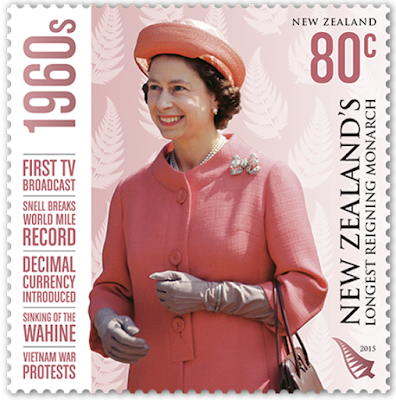 From our sporting successes to national tragedies, royal visits to quirky animals, changes in economics and politics to New Zealand’s appearance on the world filmmaking stage, these stamps tell a story. 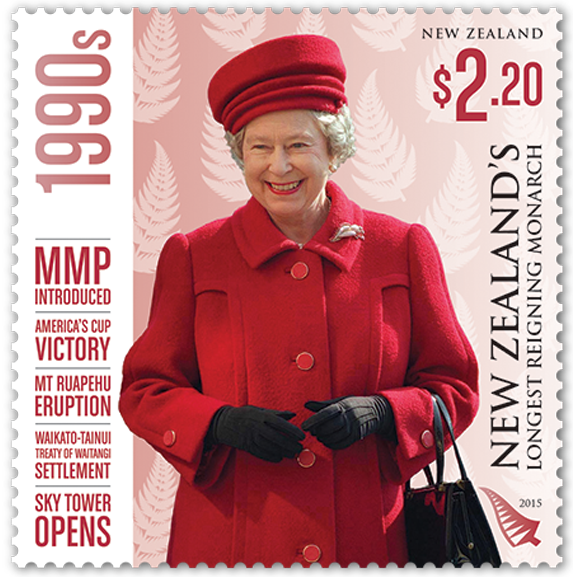 Most New Zealanders will remember and identify with key events on the stamps, and together they give a sense of how New Zealand has changed during the Queen’s reign. Queen Elizabeth of the 1950s. Queen Elizabeth of the 1960s. 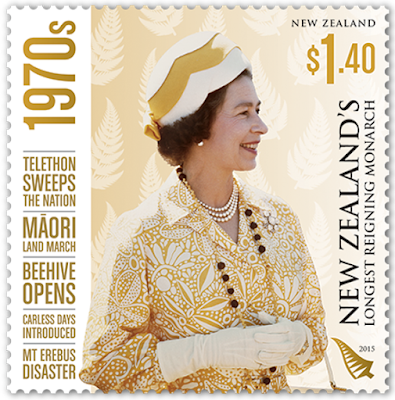 Queen Elizabeth of the 1970s. Queen Elizabeth of the 1980s. Queen Elizabeth of the 1990s. 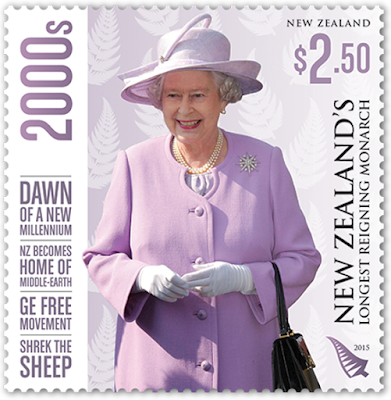 Queen Elizabeth of the 2000s. Queen Elizabeth of the 2010s. with its own First Day Cover. Southern Colour Print Ltd by offset lithography. Gummed: 36.95mm x 37.5mm (vertical). 104gsm red phosphor gummed stamp paper. 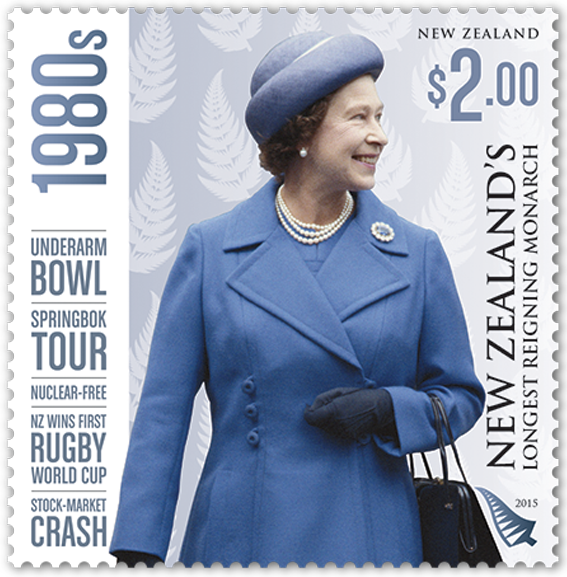 Unless stocks are exhausted earlier, these stamps will remain on sale until 6 October 2016. 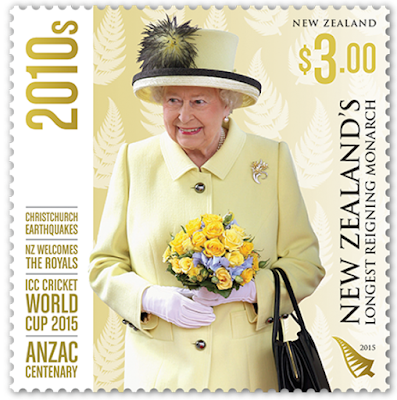 First day covers will remain on sale until 7 December 2015. Images and Text used with permission from the NZ Post web site.